Very nice work Shemsu-Heru, i like the way you brought in the details of the Gaj. The Gaj was a monster that Rikus fought in the slave pins in the first novel The Verdent Passage by Troy Denning a must read IMO. The Gaj nearly killed him and he was in the Grey while he was unconscious and healing up. 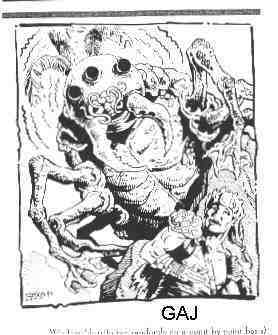 I can remember when Tonden DM us when we were teenagers in Dark Sun and we fought a few of the Gaj during one summer and it was one of the best years i have ever had playing D&D and now we are in our 40's. I must say seeing the Gaj in game brings back good memories so thanks for your work. Very nice I like the looks of that weapon a lot, nice job finding it. edit: The more I look at that blade, with a few tweaks it could be used to make a few other nice looking blades as well. I would like to Thank " Sunssarathi2029 " who is putting together our weapon and armor hak. He is doing a Great job and we are lucky to have him on our team. Thanks a lot for all your time and work you putting into this hak " Sunssarathi2029 "
Here is a look at just a few of the weapons that are in the hak he is working on. Another week has come to an end, so once again I ask for all team members to send me an updated copy of the haks they are working. Thanks for all the time you all spent working on these haks this week. This project is moving right a long thanks to each and everyone of you. The people working on this project have school, work, families, and other real life responsibilities that need to and should come first. There for, they only get to work on this project in their free time. So the more people we have helping work on the project the faster it moves a long. This is why we are alway looking for new people to join our team and hlep bring the world of Athas (Dark Sun) to life using NWN1. If you think you could or if your willing to try and help us with this project please feel free to contact me at one of the following. Little quick advice. I have read that some spammers use bots to scour message boards for email addresses. Whether or not this is true I don't know. All I do know is that I personally wouldn't post mine when personal messaging is easily available. Yes we downloaded it some time ago and got it all working in a base module. Oh and yest ist a prestige class. Dizzitt is a really BIG fan of Psionic's and just about everything in Dark Sun has Psionic powers, so it was a must have for our project. But thanks for pointing it our, for you never know if you come across something that we haven't yet. My goal is to do a weekly highlight tomorrow. Oh YES Please do. I even know what book that art work is on the cover of. I have always liked that picture, so I would love to have that helm. Thanks for pointing these out " Shemsu-Heru ", we are going to look into getting some of these for the project. I would like to thank Shemsu-Heru for making a very unique Dark Sun creature. Rikus fought this creature in the novels and came close to dieing. Here is some art work of the Gaj so you can get an idea of what it kinda looks like. And Thanks again to Shemsu-Heru for bring the Gaj to life in our NWN Dark Sun Project. That said another week has come to an End and I would like to ask all of you (our members) who are helping bring this world to life using NWN1 to upload a current up to date copy of the haks you all are working on. Thanks once again for the hard work and time you all have spent this week working on these haks. Thanks to each and every one of you this project is coming along nicely. Thanks to “ Time Bandit “ for the very nice looking Large Icon Artwork to be used for our Dark Sun Project. There is a lot of work involved making and putting together a Ver Large Project like this from scripts, artwork, models, and so on. It takes a lot of people putting more hours then we can count to make the whole thing come together. So thanks again Time Bandit for the work you have done so far and are still doing for this project. Another week is coming to an end, I know the weeks just seem to be flying by way to fast. That said, its that time again Team, could everyone be so kind as to upload/send me a up todate/current copy of the Hak/Haks they are working on. Thanks once again for taking time out of your busy week to work on these haks. This project is coming togethter thanks to each and everyone of you. I used to think that I liked making things for NWN1. However now that I'm using GMax to make custom content WOW I ABSOLUTELY LOVE making custom content for NWN1. I find it more enjoyable then playing any game out there, who would have known, although my favorite toy as a kid was Lego's. I have been working on making some stone painting artwork for in game, that will be placed on the side of the Ziggurat. All I'm really doing is finding Dark Sun artwork on the internet that I have always like the looks of and recreating it using a paint program. I't a lot of work and taking a good amount of time per painting because I want them to look like paintings on the side of a stone wall and I want them to blend well with the textures in the tileset I'm working on. I had done 4 before I really started getting the hang of it and the first 4 I did look ok, but I wasn't really happy with them. That said I really like how 5 and 6 turned out. So I may be going back and redoing the first 4. All that said here is the last two I have done 5 and 6. I have to say the work you've done so far for this project is impressive. Well Team its that time again, another week has come to a close. So when ever you all have time could you please send me/upload a current up todate copy of the haks you all are working on? Thanks for the time and work you all put into these haks this week. 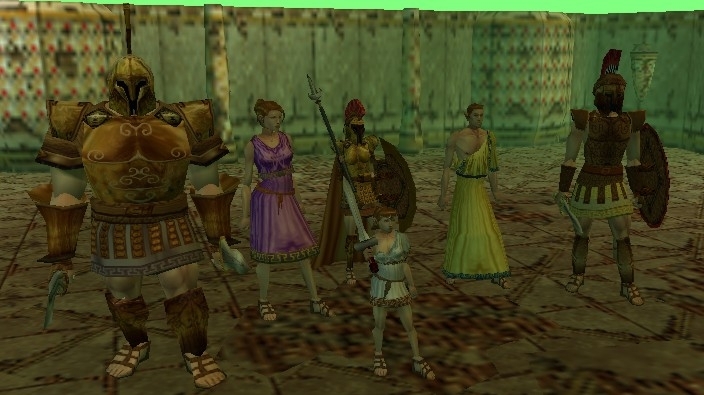 The work each of us are doing is giving us all the content to bring the world of Athas (Dark Sun) to life using NWN1 and I can't wait till the day we can walk the streets of Tyr together. Thanks to Draygoth we now have working Dark Sun mounts with more on the way. Very nice work with these mounts. Thanks for all the work you are doing for this project Draygoth. I hope to see some collected packages soon. Love the chariot, very nice. That's also a neat reproduction you made in paint, Tonden -- custom details like that will really help sell your setting, I think. Thanks to " Time Bandit " for contributing Tombs & Traps Icons for our Project. 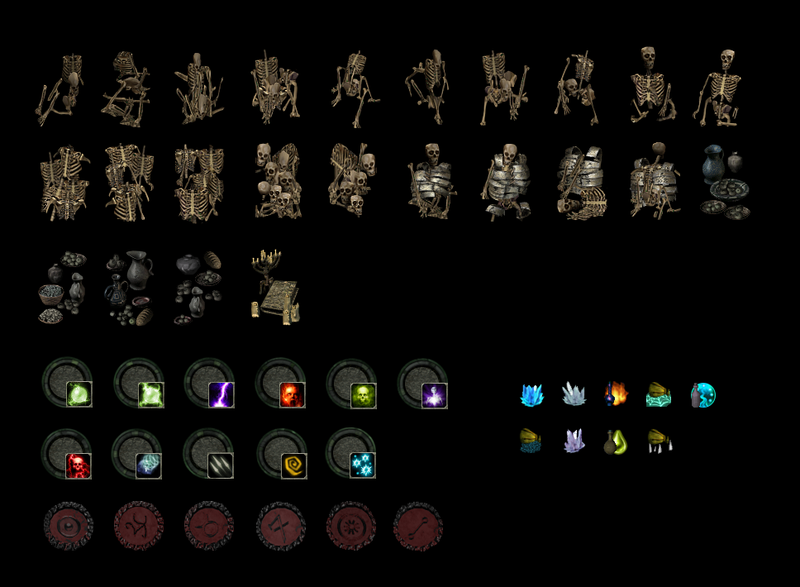 A project this size takes a lot of work from playable races, tilesets, creatures, placeables, items, scripts, and even icons. Every one of these things takes people hours of their free time to do. So again Thanks to Time Bandit for all the time that went into putting together this collection of icons for our project. 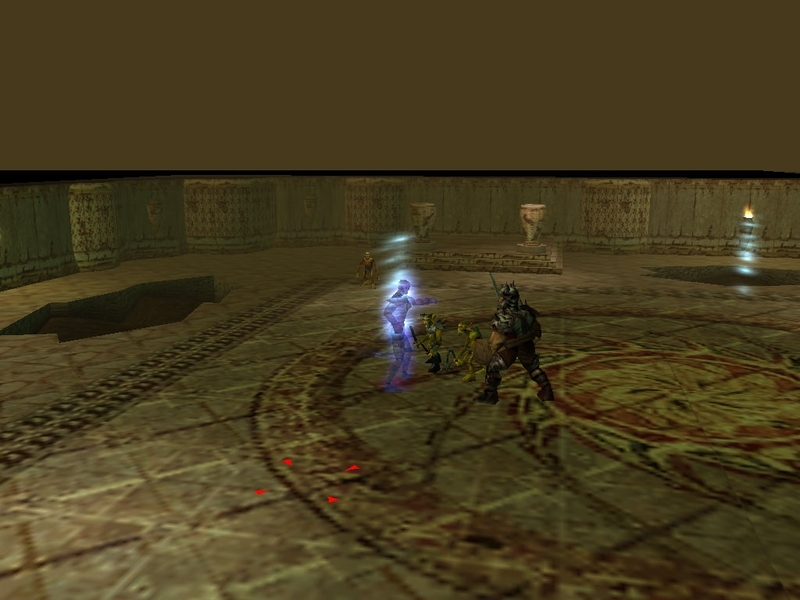 Dizzitt and I both have been fans of Dark Sun for over 24 years now and fans of NWN1 sense it came out in 2002. We both know what we want for this project and we both are willing to put in countless hours to do whatever is needed to bring this project to life. I personally know for Dizzitt and myself that this project has been and is consuming all of our free time and then some :). However the other team members have really been putting a tremendous amount of hours each week as well. We don't just want to use what is already out there and just reskin it to try and make it look somewhat close to Dark Sun. Before we decided to start this project we told ourselves if we are going to put in the time to do this, then we are going to put in the time to do it right. After all why waste time just making a project that falls short? There for, we have had to learn how to use and work with haks, textures, 2da's files, .set files, itp files, Gmax, and so so much more. We are even learning how to make custom races. 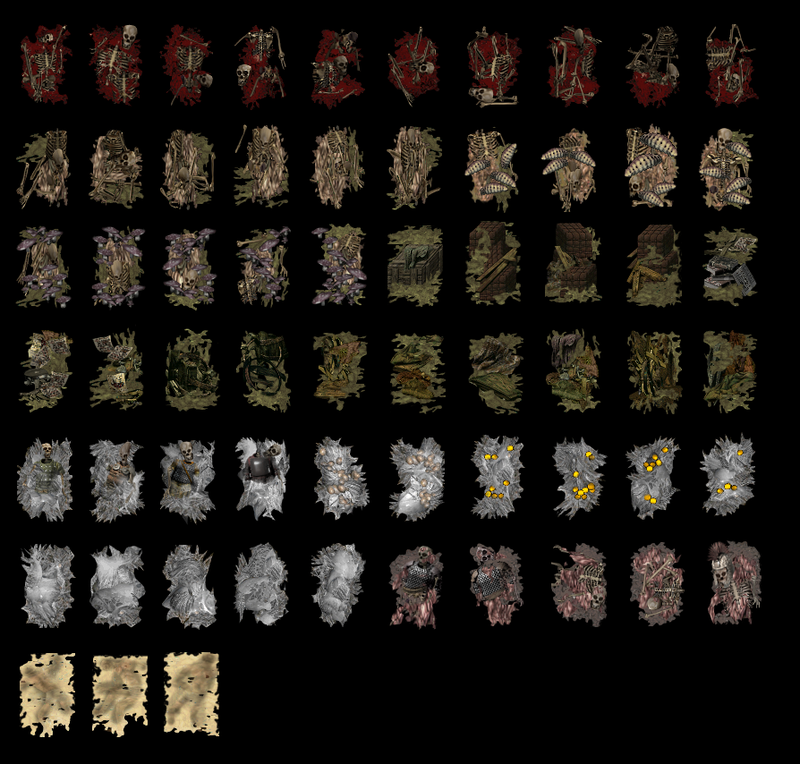 * All these will be able to be played by players and be able to ware armor just as the standard NWN1 races do. Players will be able to pic these races at character selection. *The only exception being the Tri-Kreen to some point only because in the First dark sun setting they couldn't ware armor but they got a Base AC of 5 due to their hard shell for a body. At this point we do have working 7 foot tall elves, strong stocky Muls, and 12 foot tall Half-Giants as playable races with the others to come. Oh and No we are NOT using PRC or NWNX to do this. We are doing all this by making custom haks. We just really want nothing but the best for this project and if that means we have to put in more hours and learn more programs then that is what we will do. I would also like to thank everyone in this community who has had a hand in helping use to learn what we have and still need to learn to make this project come to life. @ Guile Maybe you should stay for a while. Well Tonden Ockay, I tell you what, I hereby give you express written permission to use my content in your project if you want to. I'd even be willing to churn out some code for you if you need help with specific stuff. That would be awesome " Genisys "
I haven't had time to look over/check out all the stuff that you have put out so far. I just have so much work to do with all the models and stuff right not. That said I was planning on checking a lot of it out once I got to the point where I needed to start adding scripts. I can say I really like some of your ideas. I'm really trying to stay away from program/systems if at all possible. I'm more of a fan of simple independent plug and play script systems. I have liked what I have got to read of the stuff you posted and I would love to use any or all of your work that would help us with our project. If you do allow us to use your work we will not pass it on to anyone without your permission. 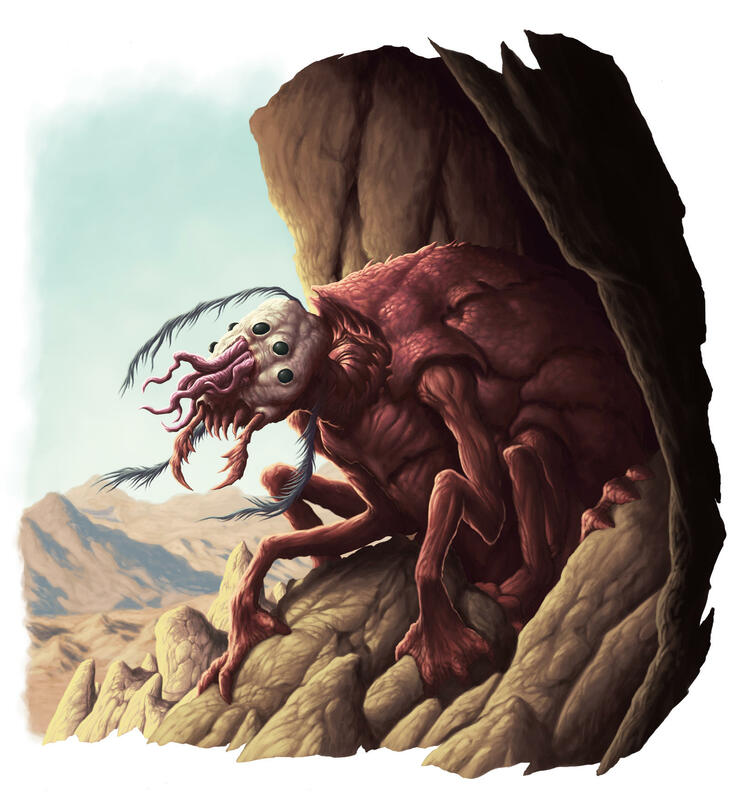 As for the Death Claw monsters I think we could fit those into Dark Sun. I will even get with Draygoth and see about making some for our project. The nice thing about Dark Sun is that a lot of the world is unknow, which makes it nice for DMs and projects like this one. Frank Herbert's Dune - https://www.youtube.com/playlist?list=PLB801E86C36F7D971 - And it's sequel Children of Dune - https://www.youtube.com/watch?v=dZdj5NJj-Bk&t=2436s. Have amazing soundtracks which fits well with a desert world theme. Well, just check out the 1.69 base module, it's kind of a "what you see is what you get." Let me know how I can help scripting & I'll do what I can for ya. Thanks Shemsu-Heru for the music, I will be cecking all of it out for sure, so thanks once again. Thanks " Genisys " for the module and offering your help. I will check out your module as soon as I get time and then I will get back with you at that point. Thanks again for everything. I hate to stop the party, but using such kind of music on a server is dangerous. Guess no one wants the lawyers of MGM, Warner Bros and all these companies at his tail. A possible solution could be to override NWN´s music with the new tracks. (The players simply rename their music folder with the old tracks and make a new folder for the DS themed music) There wouldn´t be a connection between the server and the tracks some people got in their override. There's some decent tracks over on Open Game Art with suitable licenses. Just click on Browse -> Music. You may need to search a bit for suitable tracks. Very nice " Rjshae " thanks for pointing that website out. I have to say I only checked two out so far and I like them. Don't know much about Dark Sun.. it sounds like a sort of Conan setting.. But what you guys have created so far is pretty amazing. I look forward to see where this goes and would love to play anything you guys release. If you need scripting help - give a holla. We are don't currently have a scripter so I'm sure we will need scripting help in the near future. I just changed the over all look of our website and there are more changes in the near future. I have taken the NWN2 placeable Buildings and brought them into NWN1, here is some screenshots of some of them. I'm still working on textures but they are close to the look that I'm going for. I also have plans to turn these placeables into tiles for the tileset I'm currently working on. However its just not at the top of the list at this minute. Building look nice and I like the new look of the web site. I'll have an update tonight. That sounds great " Draygoth " I was just on the phone with Dizzitt and we both can't wait to check it out. Just thought I would throw this out there and see if anyone would be interested. Would anyone in the community like to take the placeable NWN2 buildings that I have converted over to NWN1 placeables and convert/tramsform them into tiles so they can be used in the desert tileset I'm currently working on? If not I will do it, however just going to be a little while before I can get to it is all. We are trying to get one of the Tri-Kreen creatures to be a playable race for players. We have it showing up at character creation, but when you enter the game it doesn't have animations. However it has animations as a creature and in Gmax. Does anyone know how to get the animations to work? We were doing it this way only because we wanted the race to have the Tri-Kreen animations instead of the humanoid animations like all the other playable races. 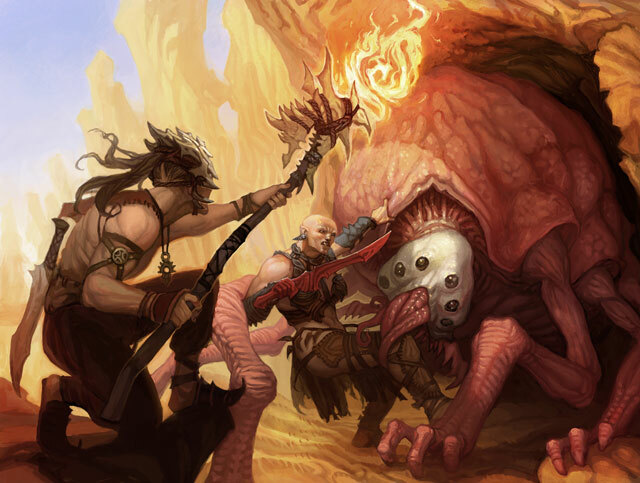 Plus Tri-Kreens couldn't wear armor in 2nd edition Dark Sun any way. There for, we don't need it to work the same as other races when it comes to armor. Can it be done this way? Does it have to be set up like the other races and have the humanoid animations? We reworked the elves and made them taller then humans, made mulls that are stockier then humans, and made Half-Gaints, which are about twice as tall as humans. All three races can be picked from character creation and all the armor works for them just fine. 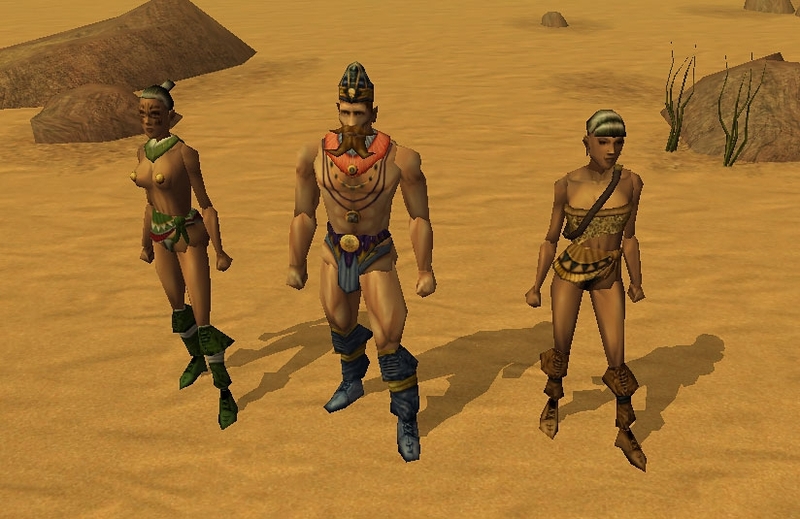 So we know how to make custom races using the playable race skeletons and armor/skin models. We just don't know how to get a creature to use its animations when set up as a playable race. So basically we have been making Dynamic playable races and now we want to make a Static playable race. My gut tells me something might be up with the 2da entry for the Kreen. Have they been set up with the right sort of the number of animations they have?